Neurologists are the ultimate medical detectives. 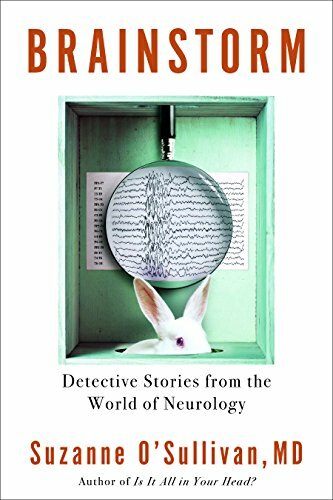 "No less than any other type of detective, a neurologist must question the story they have been told if something about it doesn't sound right." They use their investigative skills to interpret the clues and to reach a diagnosis from the symptoms that the patient describes. It's like solving a puzzle when many of the pieces are missing, since there are still uncharted areas of the brain. Neurology is one of the most complicated and beguiling of all medical disciplines. Until the 20th century, the only way doctors learned about the brain was when it was diseased. However, recent advances in medical imagery, such as CAT scans and functional MRIs have helped the medical profession to understand the healthy brain. Suzanne O'Sullivan relates stories of difficult neurological cases. Epileptic seizures occur when there is a massive or focal electric discharge (a storm) by the neurons in the brain. They are involuntary and not the fault of the owner. They either are generalized or occur in one specific location. Epilepsy is not always uncontrollable shaking and body spasms. It's manifested in several different ways. For example, the patient who had goosebumps and the doctor who almost missed the diagnosis. It could even be a blank stare or a sudden jerk. The author follows the lives of 12 patients from all walks of life, each suffering varied epileptic seizures. Diagnosing these symptoms was more challenging because, in some of these patients, the EEGs were normal. "Scans and EEGs provide nothing more than guidance. They are all shadow puppets." The method she used was to admit her patients to the telemetry clinic for seven days or longer. They were sequestered in a small room with electrodes attached to their scalps and video monitors. She was hoping to actually capture a seizure when it occurred. This was not only invaluable in helping her diagnoses, but it also revealed how much of the brain remains unknown. A select few of her patients opted for surgery that was successful in stopping the seizures. Wahid would suddenly wake up in the middle of the night and point to the wall as if he saw something there. Amy actually enjoyed the aura she felt at the beginning of her attacks. She felt like she was being sucked down a hole, like Alice in Wonderland. There's an unsubstantiated rumor that Lewis Carroll had epilepsy and may have transferred the chaos in his brain to Alice in Wonderland. "Epilepsy, in particular, is all too often odder than the folklore that surrounds it." Donal, a school janitor, saw cartoon characters in plant pots and under his bed. "I opened my eyes and saw something running across the room. They came through the door and ran under the bed." This hallucination could have been conjured up from childhood memories or from his imagination. He was diagnosed with epilepsy, and he responded well to medication. Eleanor was a ballerina who began falling and stumbling over objects. Lenny's attacks were so dangerous that his heart stopped for a few seconds, then began to beat again. The first time Sharon felt unwell was when she was travelling in the Underground. She suddenly collapsed and lost consciousness. She was referred to the author's epilepsy clinic. When all her tests were normal, the diagnosis was dissociative seizures, not epileptic ones. Further proof was that the drugs she was given by another doctor had no effect. Because the reason for this condition was emotional, it was difficult to convince Sharon. Perhaps her seizures happened unconsciously to protect her. "Sometimes our brains shut down, dissociate, to avoid something unpleasant." Other potential causes are loss of a loved one, sexual abuse, or extreme stress. Although it's considered psychosomatic, the loss of consciousness is real. "Physical symptoms that happen for psychological reasons are real." However, it's difficult for others to accept a hidden disability. Cognitive Behavioral Therapy helped Sharon to overcome these seizures. Unfortunately, not all treatments were successful. When August, age 16, was in the schoolyard, she suddenly stopped what she was doing and ran until she was on the street. Just as suddenly, she stopped running and came back as if nothing had happened. She thought nothing of it, thinking it was a one-time event. She also couldn't explain it. When these episodes became more frequent, her mother made an appointment with the epilepsy clinic. Dr. O'Sullivan's diagnosis was epilepsy. However, the drugs she tried didn't make any difference. August was always cheerful and cooperative. Fear of her attacks kept her at home. She began a baking catering service from home. She related that she had wanted to be a doctor and about other future plans that were thwarted. Dr. Sullivan saw the whole person and not only her brain. ". . . I didn't really know August as well as I thought I did. I only knew the version of her that had epilepsy, but there was girl before who hadn't needed to live in a cage." The author reveals how much she has learned from her patients. Ray's seizures didn't respond to medication. He described a good feeling, like being on a cloud and looking down at everybody. He was placed in the telemetry clinic where he had a full-blown attack which the medical staff were able to observe. Ray himself also looked at the video. At first, he seemed to be searching for something. Then suddenly, he began to swear at the nurse in the room and threw a spittle at her. Ray didn't remember this episode and blamed himself. "Ray's seizure was an exchange of ions and neurotransmitters in his brain, a flow of electricity, but he still felt the need to explain his behavior." His family was worried that he might spit and swear at strangers if he had an attack on a bus or on the sidewalk. A stranger, thinking he's dangerous, might get into a fight with him. He had a seizure in a bookshop and walked out with a book in his hand. The owner called the police and Ray had to explain. People afflicted with epilepsy always need family or friends around them to keep them safe. It's interesting that there is a scientific explanation for cursing. "The brain processes swear words differently from other words. Studies of seizure semiology have a lot to say about both swearing and spitting . . . They are believed to be examples of automatism—an automatic release phenomenon that occurs because brain inhibition has been lost." Although the brain remains a mysterious organ, scientific research in the fields of genetics, neuroplasticity, and computerized navigational systems may shed more light on the interconnectedness of the brain. The patients in this book all had mysterious seizures that were difficult to treat, and were not listed in the neurology textbook. "Listening, watching and time were my diagnostic tools." Dr. O'Sullivan's patients showed her how resilient they were and how to live life well despite these challenges. The author has written a candid and honest account of epilepsy and its devastating effects. She gives the reader a glimpse of the workings of an epilepsy clinic. Her prose strikes a balance between empathy and science, listening to her patients and explaining the intricacies of the brain. She recounts her struggle to understand the puzzle when a healthy looking patient has an abnormal brain scan. This highly readable book is a valuable resource for both the layman who is interested in medicine and education and for neurologists who see patients with epilepsy in their clinics. Carol Katz has been a librarian, archivist and also a teacher of children and adults with learning disabilities and challenges across the autism spectrum. She has been a speaker on these topics and served on the Board of Directors of the Learning Disabilities Association of Quebec.